Whoopsie! Here it is, mid-afternoon on Friday, and I usually have the Ancient Lore posts appear at like 6 AM. Somehow, I was not hounded with thousands of e-mails from eager readers who wanted their weekly photo post with their morning coffee. I wonder if the e-mail server is down? But better late then never, goes the popular saying, except when it comes to menstruation. 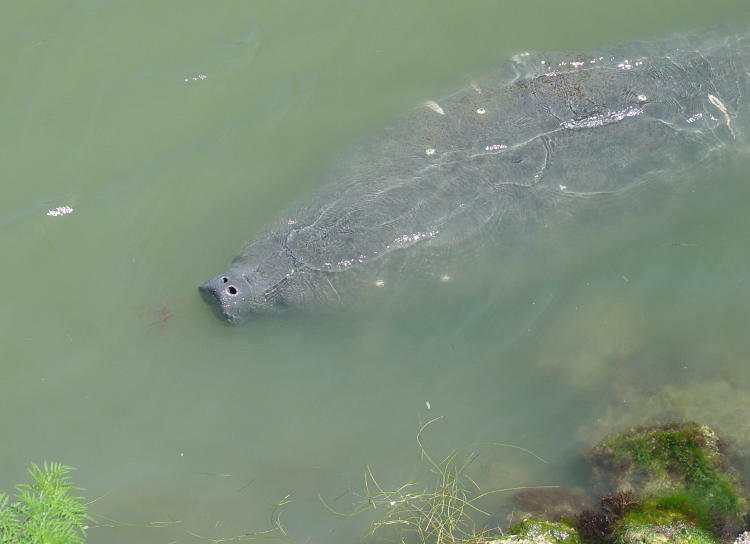 This week we’re plundering the Lakes/Streams/Waterfalls folder to present a West Indian manatee, sometimes simply Florida manatee because the West Indies is a concept created by Columbus being a dipshit. This is a relatively small specimen, likely juvenile, a little under two meters long if I remember correctly, cruising in maybe a half-meter of water right off the causeway. This is the very same causeway that’s appeared before, but the opposite side where the snorkeling wasn’t half as good, don’t ask me why (I’m forbidden to say.) Even at this young age, this one displays the common traits of every adult that I’ve seen, which are scars from encounters with boats, as well as a few barnacles. Manatees are fairly common in the Indian River Lagoon, but so are boats (which applies to virtually every body of water in Florida – people even put airboats in some of the bigger puddles.) They’re vegetarians – the manatees I mean – and graze on the plants usually found in the shallows, but here you can see something that I’ve noticed more than a few times when they’re around: loose thin grasses floating on the surface. My guess is that these are plants that they don’t particularly care for, which get pulled up with mouthfuls because those lips don’t look especially adept, then discarded. I’ve always wanted an underwater shot of a manatee, and back in those days it would have to have been accomplished with a film camera, in my case one of those disposable Fun-Saver jobbies, which I did occasionally carry with me. Some time later in almost this exact location, I spotted a mother and calf as I was biking past and skidded to a halt, since I also had the snorkeling gear with me. It took me a couple of minutes to put the bike someplace safe and get the gear on, during which the pair moved onward in their glacial way, and I slipped carefully into the water and started heading in their direction, very gently so as not to spook them. Visibility was two meters or less, at least for me, so I knew I’d have to be pretty close to get any shot at all, and I paddled along determinedly at slightly better than their normal pace (or whatever it is in the water.) Nonetheless, they either decided to cut into deeper water, or more likely, detected me coming and moved on quite a bit faster, because I made it to the base of the bridge, several hundred meters away, and saw nothing at all.